The third Doggie Do with Dogs Trust was another amazing success, with pooches prancing on the dog walk in a bid to become The Dog of Dublin 2017. The furry festival took place on September 10th in Herbert Park and turned out to be a ruffing good riot. The day kicked off with a parade of all the aspiring entrants before they battled it out on stage to see who was the best-dressed man’s best friend, all introduced by master of ceremonies Darren Kennedy. If your pooch preferred to be pampered instead of paraded, there was a place for you to relax at the Doggie and Soul tent, where blankets and cushions kept everyone cosy on the particularly windy day. There was also a mini-market for a spot of retail therapy, which was chock full of dog-friendly foods. ‘Stuff for your Woof’ owners Kim and Sara can even supply your fur baby with a birthday cake that both of you can eat! At the Cultured Canine tent kids could partake in workshops, where they had their faces painted and learned how to train a new puppy and approach other people’s dog in a safe manner. There was a celebrity in our midst too, Buttercup the Cavalier King Charles spaniel was leading a talk on how to become Instagram famous, and with over 77,000 followers Buttercup is a bit of an expert. 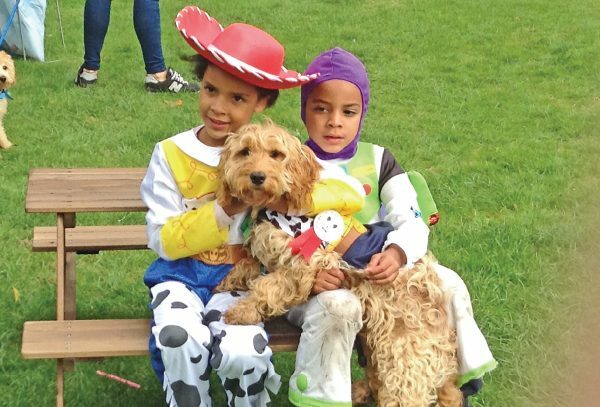 The Dogs Trust were also on the hunt for doggie doppelgangers. In a dog and human lookalike competition, festival goers had their ‘pawtrait’ taken by Audrey Dalton at the pawtrait.ie photo booth. All the photos are on the Doggie Do facebook page, where you can still vote for who you think are the spit of each other.